It's mana...tea time! 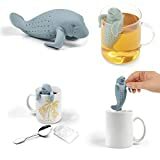 Save waste and add a little fun to your tea time with the MANATEA Infuser from Fred. The infuser is constructed from BPA-free silicone, which is soft, food-safe and tasteless, so it won't affect the taste of your tea. Simply fill with your favorite loose leaf tea and perch the tea infuser on your cup to enjoy perfectly brewed tea! This tea infuser perches on the rim of your tea cup so you don't have to worry about fishing it out. The silicone construction is easy to clean and is dishwasher and microwave safe. The infuser measures 4-1/2 by 3 inches. Designed in Rhode Island, by people! FUN & FUNCTIONAL: Everybody's favorite Floridian wants to brew you a nice cup of tea and share a slow, calm, relaxing moment. This charming animal design is sure to make you smile. MANATEA is packed in a colorful box perfect for gifting! EASY TO USE: Simply fill with your favorite loose leaf tea and perch on your cup to enjoy perfectly brewed tea! PREMIUM QUALITY & AUTHENTIC: When you purchase tea infusers from Genuine Fred, you are guaranteed an original product that is constructed from food-safe, BPA-free silicone. This material is soft, non-toxic, and tasteless, so it won't affect the flavor of your tea. HASSLE-FREE CLEANING : After use, discard the loose tea leaves and rinse with hot water. Fred silicone tea infusers are also dishwasher and microwave safe! ECO-FRIENDLY & REUSEABLE: The dunk-brew-toss routine of normal tea bags contribute tons of waste to landfills and are not sustainable for our planet. Fred reusable silicone tea infusers for loose leaf tea are the ideal, eco-friendly alternative! You can drink the same amount of tea without the waste! Interested in the Fred MANATEA Silicone Tea Infuser? Is the price too high? You can easily price watch this product and we'll notify you when the price reaches your target.